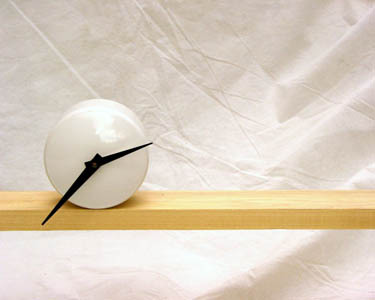 This simple white clock is made from and end cap for Schedule 40 PVC pipe. It's designed to sit on the edge of a shelf with the hands swinging down past the shelf's edge. A weight epoxied to the inside of the cap helps to keep 6:00 in the same position and prevents the clock from rolling away. A hole is drilled into the cap to accommodate the stem of the clock movement. While part of the appeal is the humble materials from which it's made, someday I'd like to to make the same form in unglazed white ceramic.